Sly looks, knowing grins quickly concealed. A beacon of their anti-individualism. Over the holiday I read Wildwood by Roger Deakin. It is his quiet celebration of a life spent with trees; learning their ways, being amongst them; using their fruit, and in their second life, their timber, their tinder. What is striking is not just how different one species of tree is from the next, but how each tree is an individual: its burrs, its knots, its shape, its bifurcations; down to the separate world that lives deep within the folds and knurls of the bark itself; each in a way as a separate from one another as our cities; distinct but unique, able to communicate, an interdependency of richness. It is both an uplifting read and a soul-stirring one. As the story of our lost ancient woodland unfurls, as the realization of how much has fallen under man’s saw, then it takes on a haunting, elegiac quality; not in morose prose but in accenting the profoundness of our loss. This week I was uplifted by trees though. Driving through the weaving, wandering, looping lanes of Herefordshire, one minute I would be surprised by the forceful push of large lorry wafting along a road built for carts, the next confronted by a green verge running along the road’s centre, high banked hedges and overtopping trees, their outermost leaves gently dangling and waving above your head. I had forgotten how that land is defined by short, steep hills, fields that pitch and flow into the distance and stands of ancient trees; uneven in height as the eye pans across them; uneven too in shape, colour, form. Trunks of brown; deep greens and grey; and, even at the start of Autumn, abundantly, vigourously plump with life, sap, fruity vitality. Just outside Ledbury, heading west, is apple tree land. The trees follow the natural contours of the land, planted years ago in immeasurable stands forming today’s superficially boundless orchards. The apple seems a proud tree, rounded in form yet spiky close to; planted en mass yet independent, shapely, interesting to the eye. This year, apparently, has been a bad year for wasps and a good year for fruit. So it seems; trees lining the roads hang saggily under the weight of a large and ebullient crop; dessert apple in size; preening themselves with red-robin bellies to the sun. Earlier I had drunk some farm-pressed apple juice; it was rich, fat and delicious; now I looked forward to the fermented version from these same apples. Later that evening, I inspected my hops. They’re ornamental not for brewing, but they snake and bind pleasingly through a corner of my garden; bullying some plants, clinging on to others, finding holes in my fence where knots have fallen out, and pushing through, looking for the sun. The cones are just passing their best but are still lime green and resinous, almost to the point of dripping their oils. Some I will dry; others I will put in the house for the aromas; most will be cut back in waiting for next year’s hop shoots and riotous cycle of growth. 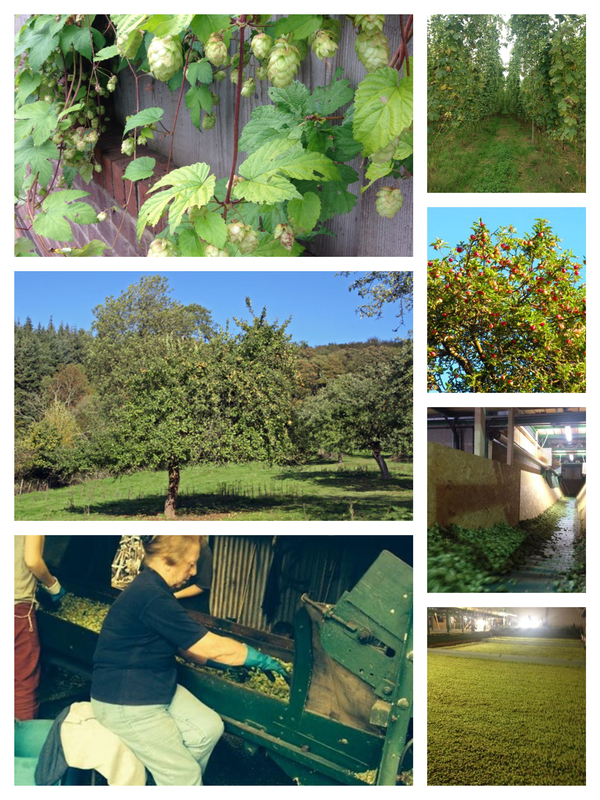 The apple-hop connection was only made later when a former colleague, Jo, posted some pictures of a Ledbury hop farm onto facebook. She had been to the farm the same day as I had been gazing on the apples and to watch their harvest; the bines twelve to eighteen foot; broad leaves like maples and dark, fleshy cones in bunches like a prize fighters fist. Most cones are stripped from the bines on a heath robinson contraption that cycles a hook round and round at head height; the bines dangle like a freshly butchered carcass before being sifted and sorted by hand and laid out like a thick pile carpet to dry. Like the fat apples, they spoke of spicy, citrusy, earthy beers to come; I licked my lips in anticipation. For many, and for many a long year for me, cider and beer are like cats and dogs: you are a ‘beer man’ or a ‘cider man’; the fruit or the grain; the press or the boil. But nature doesn’t see it that way. In this thick tilled soil, on those rolling hills, both are at home; growing, ripening with the passing of the sun; blossoming richly in time for harvest and to sustain us all. 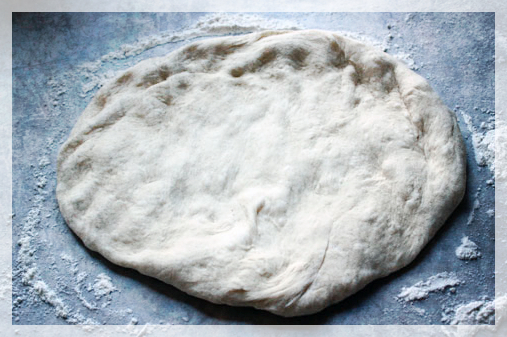 One of our many rituals is Friday Pizza Night. It’s a signal; the end of the working week is here. An end to weekday patterns of snatched lunches or mismatched family meals. Everyone likes pizza: sitting round; a big knife; chopping big wedges unevenly, roughly, indecorously. From time to time, when time allows, we make fresh bases. Strong white flour, sieved and dusty, a fine veil drifts down by the morning. Greeny-yellow olive oil; flakes of Maldon salt and the magical yeast. To mix, we grab everything together in a claw, like a digger’s grab, pinching and squeezing, mud-flat mix oozing between fingers and thumbs. Not all of us love the kneading but I do and Em does too. Giving it some, elbows out, top teeth gently pressing into bottom lip as she pushes and folds and shoves and pulls. Em had a pizza party for her birthday. We made five times the normal amount and let it rise on top of the stove; a wet RNLI tea towel that’s seen better days, damp and laid across the oiled glass bowls. One hour. Two. Then a little pummel, divide and rise again. Down the cellar we left them, on metal baking sheets, loosely draped with cling-film, ten little bouncing cobs, creamy white, dusted with flour and the iridescent sheen of olive oil. Godisgood. That’s what the ale-wives called the wild yeasts they couldn’t see, assuming it was the hand of God. Godisgood: out of little comes plenty. Godisgood: the invisible hand of a benign force, watching over us, keeping us, feeding us. Next day: we lifted the latch on the angled cellar door and trod down the uneven stone steps. How do you describe the smell of Godisgood? A brewery and fresh brewed beer, of course. But more than that: waxy lemon peals, unpasteurised cream and even, strangely attractive, a coat of fresh emulsion. Now: no longer the Midlands cobs, but Lancashire oven-bottom muffins, flat and round, a hand wide and a thumb deep, pock marked by escaping gas, billowed out, nudging their neighbours. We broke them apart, the kids flattening them with outstretched fingers; some flipped them, some threw and spun them. Atopped by smears of pressed tomatoes, runny mozzarella, spicy pepperoni – all manner of treats. The best pizzas ever? Of course: Godisgood. I don’t have a beef with Starbucks. Many do, either because of their alleged tax cleverness, or due to their ubiquity. But living outside London, they pop up less frequently and are often better quality. There’s a drive through not far from me which is excellent – the staff clearly value their jobs, love what they do and compared with Welcome Break or Road Chef, it’s a beacon of quality on the road. Brand consistency equals reliability, both a blessing and a curse (if you don’t live up to expectations). 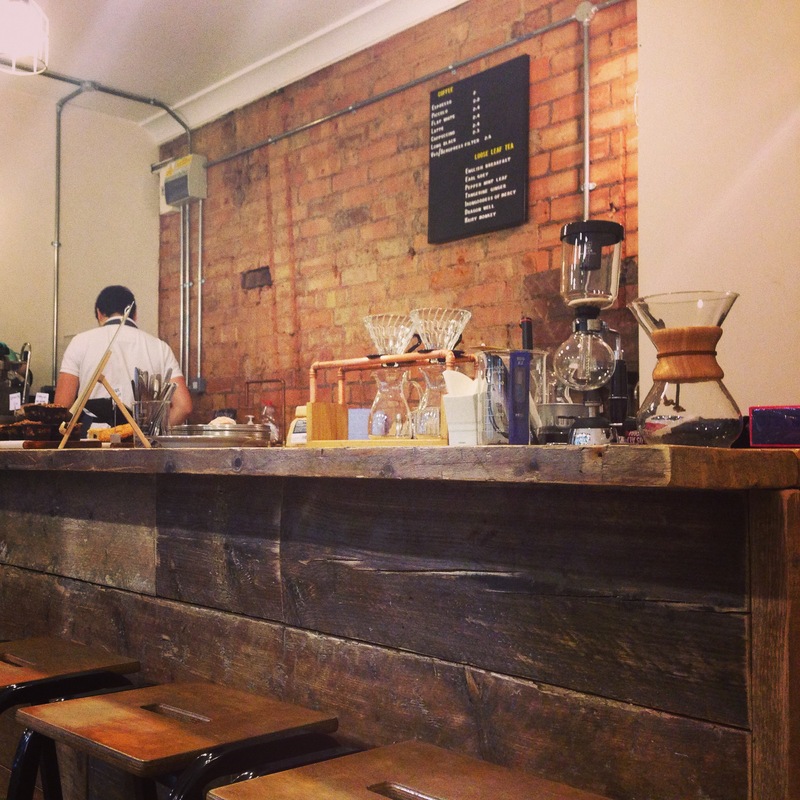 That’s why I like independent coffee shops. Oh, of course, many just get it wrong but when you find the opposite, someone who nails the ambience, the drinks and the food, they can’t be beaten. On my Ikonic Birmingham trip I discovered Faculty, nestled somewhat gloomily, in the Piccadilly Arcade close to New Street station. Why Faculty? I’m not sure. It’s too small to study there for a prolonged period of time and there don’t be seem to be Professors professorially conspiring around the eclectic collection of tables between lectures either. But there was a Chemistry Lab vibe hunkering down around a recycle and reuse ethic. I’m not sure the counter was made from old Chemistry classroom benches but it felt like (in a good way). The cakes most certainly weren’t though. The peanut butter brownie I had was from the grave: it was simply to die for. 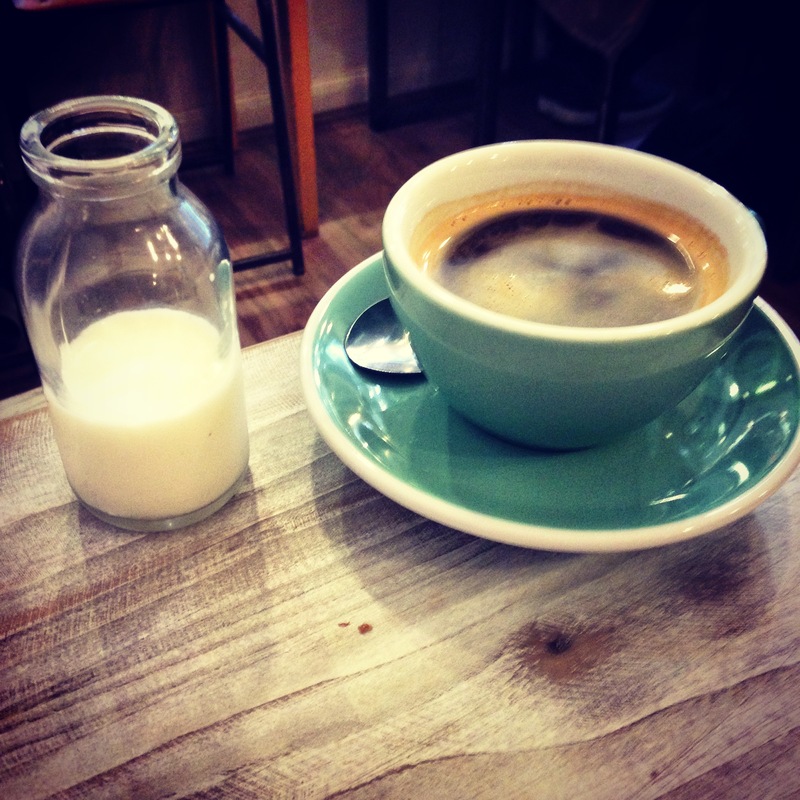 And the milk for the coffee in mini-urns was a nice touch. Next step: heat coffee for drip method with Bunsen Burners. Note to self.